Pictured Above: After the death of Freddie Gray, Google Maps developed a satellite view of Baltimore categorizing and pinpointing different facets of riot activity such as fires, lootings, etc. Pockets of lootings, coded by red bubbles, exist within single-digit miles of the Johns Hopkins University Homewood campus. JHU is located slightly north of the protest and riot activity in downtown Baltimore. From the top of their dorms and apartments, students captured iPhone videos of buildings burning in the distance. Our university Snapchat’s Snap Story is filled with videos of pacing police officers and uniformed National Guard in the Baltimore Inner Harbor and students’ attempts to pass the time indoors while abiding by the 10pm-5am curfew that has been set for the next week. 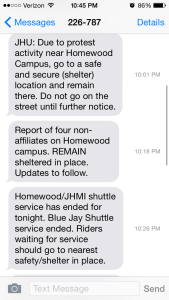 A screenshot of the rapid escalation of JHU security updates. The problem with living on a college campus in a widely impoverished city is that the students often forget we are part of a larger community. We are jarred awake only when hardship infiltrates what we call the “Hopkins Bubble.” Our campus is relatively safe, with hefty safety measures and constant security updates via text and email. Still, Monday, riot activity quickly moved north—within a two mile radius of campus—and hit students hard when we were told that we should remain inside. This was followed by another message emphasizing, “REMAIN” in capital letters. Four non-affiliates were spotted on campus: one was arrested, while the others were chased away. Reactions from my peers have been mixed. When the report of non-affiliates came in, my roommate was stuck in an academic building. Thankfully, she found another friend with whom she spent the evening until further instructions were given. I was terrified for her and hoped she would get home all right. She was eager to find a way back to our apartment on the edge of campus. Most of my friends used our group text conversation to ensure everyone got home safely and ask if anyone needed to be escorted home. A few of my sorority sisters bought food at Giant and brought it to local churches, a noble outreach to the Baltimore community. Meanwhile, some students have taken to Yik-Yak to express their grossly bigoted opinions on race. This caused rightful uproar among the student body. In true Hopkins fashion, some students were more worried about studying and finishing homework than getting home and locking their doors. In the past 24 hours, I have certainly learned a lot about the nature of my peers. For the first time for many students, we are experiencing something real, even if it hasn’t fully popped the Bubble. Something we all have in common is that we aren’t sure how to react. We don’t know how to express our feelings on these events without appearing disrespectful or prideful. The word privilege has been used many times by now, but I will just use it once more. We are privileged to be protected by so many security layers thanks to our university. We stand humbly by, trying to figure out how we should feel while others are suffering as Charm City burns. My peers and I are merely living on the outskirts of history and violence. We are also near peaceful protests with meaning that have been overshadowed by necessary measures to keep Baltimore’s citizens safe. Although we aren’t in the middle of the turmoil, we aren’t entirely removed either. We fear that our friends won’t arrive home safely, our locks won’t hold up, or masked gunmen will come closer to campus. For now, we take this time under curfew to consider how we fit into the events in Baltimore. We think about the greater problems of racial discrimination and police brutality, and the ways in which we can better relate to our community as students at a high-caliber institution such as Johns Hopkins. As I conclude this stream-of-consciousness piece, I feel as though I have written nothing at all. I feel too small to present a call to action. For now, I will sit in my apartment and await further news updates. I will text my friends to ensure that they are safe at home. Most importantly, I will take time to embrace the memory of Freddie Gray and encourage those around me to do the same. We may not be on the front lines, but we can certainly use this time to shape our hearts and minds in a peaceful manner, so that we might bring change for the better.